The original Muddler Minnow was introduced in to this country from America in the late 1960s.It was tied to be an imitation of the sculpin minnow. The original pattern enjoyed great success on the Midland reservoirs when it was first introduced. British reservoir anglers, as always, have this shameless habit of ‘improving’ everything that they try. It was not long before the Black muddler, black body and silver rib, was the in fly quickly followed by the Texas Rose and the Orange muddler, orange body and gold rib. The one thing they all had in common was the deer hair head. This was achieved by using spun deer hair and clipped to form a bulky bouyant head. Hook sizes from long shank 6 to 10. It can be quite an exciting fly to fish when you strip it through a big ripple when the trout are high in the water. You wont get as many as you miss but it can liven up a days fishing. 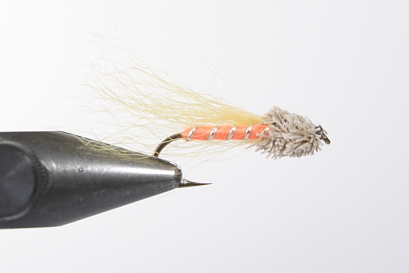 Once you have mastered the tying in of the deer hair and trimming it to shape there is no end to the patterns you can tie.This lesson has already inspired a line of thought with muddlers which I have not yet seen tied and I think they are looking promising. Thanks for your comments. We do spend quite a lot of time trying to make it easy for beginners. Jon is right behind me with the camera and keeps me on my toes. He does not fish or tie flies and reckons if he can understand what I am doing it is OK. Most flies have univeral appeal at some time in the season. Just yesterday I tried the babydoll which has been out of fashion for 20 yrs and caught 6 rainbows in 1/2 hour. The fish must have been having a ‘silly day’ because they would have a go at virtually everything i put in front of them. A good job they are not like that all the time. It is our pleasure to do our bit to promote fly tying and the response we get is very encouraging. I am new to fly tying, a couple of months now, and just located your website. It is excellent instruction and rivals or beats anything that I have seen to date. I have tied some of your patterns and also using the US pattern. I live in the central part of the states and I find that trout like Western flies equally well to regional patterns. I am thinking they will respond well to your patterns. I am anxious to try them out. In any case, what a fine thing you have done here and I truly appreciate it. Thank you so much. I have to concede that Iam your senior, not by a lot but enough for me to have the edge. However you are only as old as you feel and today after half a day dragging ‘a lot’ of weed out of our trout lake I feel 91. My reward was to catch the first and only trout for a week from the lake. I am confused by your name! Troy sounds classical and your surname academic?. To quote that well known gent, “You cant be serious.” Forgive me if I am being facetious. I only know that there are not too many left standing in my clan. We have ambitions on doing DVD one day. I see you are 71. So am I. I wonder who’s the oldest. My birthday is 11-1-36 and how do you like my Welsh name? Your site is great. Keep it up. Thanks for your comments. (I blush under my weatherbeaten face). There will be more vids. We will try to come up with a hackled dry fly. I tend to concentrate my efforts on nymphs, wet flies and lures. I have not done a lot of dry fly fishing and at 71yrs feel it is a little late to change my habits. Recently discovered your site. As a neophyte tyer I find the video demonstrations far more helpful than even the best photo descriptions in magazines and books that I’ve used. Your site is outstanding and I hope to learn with you for many months to come!! Any dry fly patterns on the way? Thanks for your comments. They will keep on rolling. We are giving serious thought to doing a DVD as a result of the feedback we get from the vids. Did have a memorable trip to NZ. Best day on brownies 7 fish 21/2…..3lb and lost a few. Best day on rainbows approx. 30 fish 1/2 lb ….31/2 lb. on a very fast river and lost as many. NZ South Island is a beautiful place but you need a guide initially to get the best out of it. Outstanding Demonstrations! Your efforts are very much appreciated. Keep them coming! Did you make the New Zealand trip? If so, how about sharing the highlights with us all? Thanks for your comments. We aim to please. More to follow. Thank you for your videos. The videos and the flys are top notch. Well Done! to the entire team. pleased you like the videos. We do our best. This hobby is addictive and after 60 yrs I am still finding things to make it simpler. I have seen very few variants on the good ol’ Muddler minnow pattern that are explained and illustrated simply. This was an outstanding video (as they all are). I have already improved my own tying by watching your videos, the small tips you share are things you just can’t find in the books. Thank you for your comments….much appreciated. We do our best. I have only read about the fishing in Vancouver and dreamt. PS. We are planning a trip to New Zealand in the new year. I would like to thank you for the excellent videos. Not only do I learn how to tie a new pattern but I pick up little tricks that I can use on other patterns. My fly fishing ranges from rainbow trout to steelhead and salmon. I look forward to your next video. Once again, I thank you for the effort and the sharing of your knowledge. Tying Silk Steve Parton professional tying thread. Its definitely informative and easy to follow. How about listing down the materials being used in the text as well? Just keep watching, there are more on the way. I cannot tell you much I appreciate these videos of yours. A new “disciple” is eagerly awaiting the next lesson! Thank You Mr. Cammiss for another lesson. Looking forward for the next one. David thanks for the Texas Rose video, I found it extremely informative and easy to follow. I appreciate the effort you put into these videos and find the hugely helpful and I eagerly await each ne tying lesson.